Rhinestones – Queen & Co. This Valentine was made for the CPS 5th Anniversary celebration: Challenge 13. I used the sketch (Sketch 121) as a point of departure. 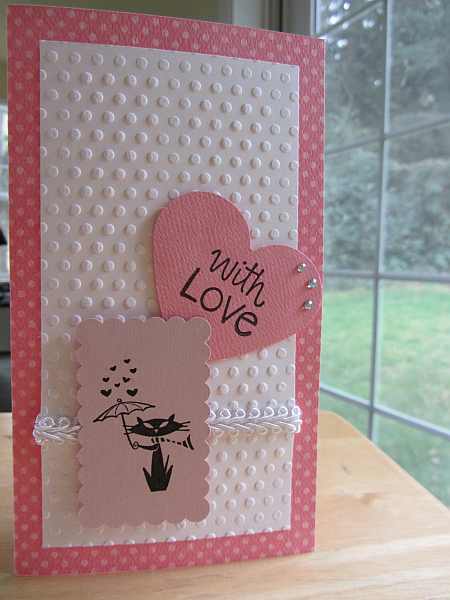 This card has lots of polka dots and texture. Thanks for visiting today! This entry was posted on Sunday, February 12th, 2012 at 9:05 pm	and tagged with cardmaking, Cat's Pajamas, embossing, stamping and posted in Challenges, CPS, TCP, Valentine. You can follow any responses to this entry through the RSS 2.0 feed. Very pretty! The embossing looks great! Lovely job, and thanks for playing along on day 13 of the CPS 5th Anniversary event!